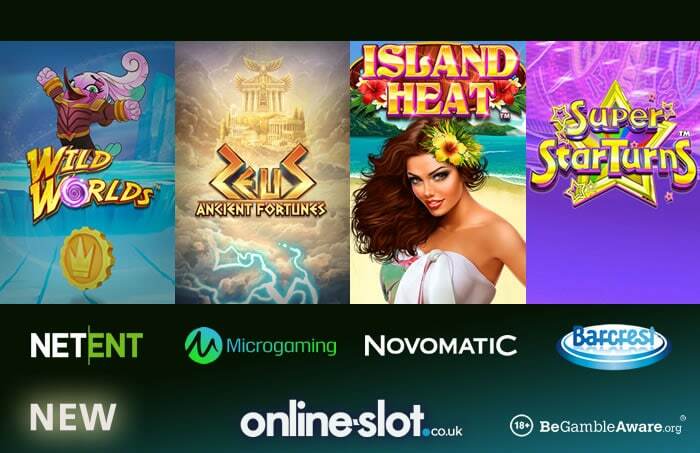 Greek Gods, a tropical paradise, a new generation of superheroes and a TV gameshow are the themes of the latest 4 slots from Microgaming, Novomatic, Net Entertainment and Barcrest. Ancient Fortunes: Zeus is a 5 reel, 10 payline slot from Microgaming that has a Greek mythology theme. Based on Gods Zeus, Dionysus, Poseidon, Hermes and Ares, you are taken to Mount Olympus where you’ll benefit from the Rolling Reels feature – each consecutive win increases the multiplier up to 7x. It gets better in the Free Spins feature where up to 70 free spins can be won – the multipliers can reach 21x too. Island Heat is a Novomatic-powered slot with 5 reels and 30 paylines. Set on a tropical paradise, 1 symbol is Mega Stacked on every spin which gives you bigger wins. In the Free Games feature, you can play with up to 32 free spins and Mega Stacked symbols for wins of up to 1,000 times your stake on each of them. Super StarTurns is a TV gameshow inspired 5 reel, 40 payline slot by Barcrest which comes with a Super StarTurns Bonus feature where you go on to spin wheels. They give you cash prizes up to 500 times your stake or up to 50 free spins. In the Free Spins Bonus feature, you’ll only see high value symbols for even bigger payouts. The Big Bet Mode also applies which gives you richer symbols, bigger prizes from the wheels and oversized scatters. Wild Worlds is powered by NetEnt and is played on a 5 by 5 grid. With a Cluster Pays engine, it has a superhero theme you aim to save worlds from monsters. You can benefit from consecutive wins from the Avalanche feature which also gives you additional wilds. With destroyed symbols and free spins, you get to travel to 3 worlds for different wilds that spread, stay in place or are randomly scattered.